I am destashing a bunch of craft things, books, magazines, DVD's etc. Love it all, but my bookcases are overflowing again. 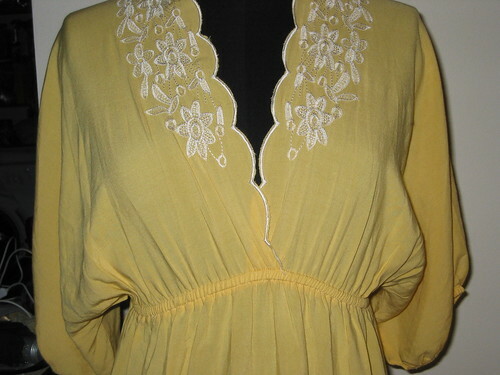 +Yellow Scalloped edged dress with white embroidery. +Weaving shuttles- long 29 inch rag weaving shuttles- #1 weaving shuttle and #2 weaving shuttle. +Green Housekeeping- a book on doing eco friendly housecleaning and organizing. + Craft Magazine: 01 (first issue). Includes the instructions for making an LED shirt! +Book: Rowan Cork Collection. This is full of knitting patterns for bulky/chunky yarn. +Knit n Style December 2008. I have an obscene amount of knitting magazines and don't knit from patterns almost ever. I just watch the shows once, we get them for while we are boating and have no TV or internet.